Light pink La Bella snapdragons and salmon ranunculus mix with lavender and purple pansies in this well-composed color symphony. Design: Jackie Gray. For blooms from winter through spring, plant cool-season annuals now so they get established and start flowering before the weather turns cold. Otherwise, they may not flower until spring. Buy young plants of calendula, Iceland poppy, pansy, primrose, snapdragon, stock, and viola. In zones 15-17, you can also plant cineraria, nemesia, and schizanthus. Or sow seeds of baby blue eyes, forget-me-not, sweet alyssum, sweet pea, and spring wildflowers. For an informal mass of flowers that can spread naturally year after year, toss handfuls of a single kind of bulb over a planting area, varying the density. Repeat with a second or third kind of bulb, if desired, then plant the bulbs where they fall. Feed with a fertilizer formulated specifically for bulbs. For the best chance of repeat bloom in subsequent years, choose a site in full sun that doesn’t get much summer water. Bulbs that naturalize reliably in mild climates include allium, daffodils, leucojum, muscari, scilla, and species tulips (which often return year after year in mild climates). Zones 7-9, 14-17: For blooms in spring, fill a big pot with one type of bulb, whether daffodil, hyacinth, or tulip. Sunset head gardener Rick LaFrentz uses this method: Fill the pot with potting soil so bulb tops will sit about 4 to 5 inches below the pot rim. Firm the soil, then set the bulbs closely together on top; a 16-inch flared pot will hold 40 to 50 tulips, daffodils, or hyacinths. Cover the bulbs with soil, leaving about 2 inches at the top for watering space. Set the pot in a cool, shaded area, moisten the soil, and top it with mulch; water again. Move pots into full sun when leaves develop. Flowers will appear about four months after planting. If you don’t have space for multiple fruit trees, try growing a single tree with multiple fruiting branches grafted onto one rootstock. A single tree, often called a fruit-salad tree, combines a medley of fruits ― ‘Blenheim’ apricot, ‘Fantasia’ nectarine, ‘July Elberta’ and ‘Babcock’ peaches, and ‘Santa Rosa’ plum, for example. For best selection, order bare-root trees now for January pickup from Orchard Nursery & Florist in Lafayette. October is the best month for setting out any kind of plant that’s not frost-tender. Groundcovers, shrubs, trees, and vines all benefit from fall planting, when temperatures are cooling and rain is on the way. Before buying plants, learn their ultimate height and spread. Allow room for them to grow. Many kinds of perennials can go into the ground now, including asters, chrysanthemums, diascia, gaura, geranium (cranesbill), geum, and penstemon. So can California natives such as heuchera, monkey flower, Salvia clevelandii, and Western columbine. Plant this month so these perennials can establish their roots through winter. Half Moon Bay Nursery (650/726-5392) carries a wide selection in 4-inch containers, many grown on-site. Nursery owner Ronald Mickelsen’s favorites include G. ‘Johnson’s Blue’, G. x oxonianum ‘Wargrave Pink’, and G. x riversleaianum ‘Mavis Simpson’. Sow seeds of wildflowers like California poppies, clarkia, gilia, lupine, and tidytips in a well-weeded area. 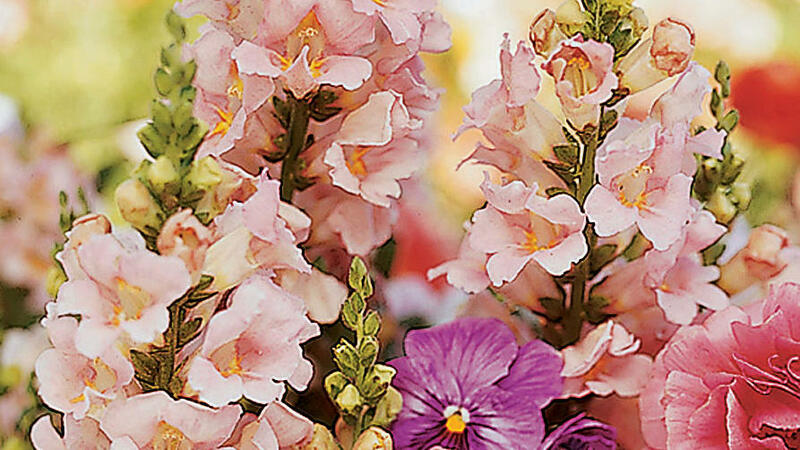 They’ll benefit from fall and winter rains and produce an explosion of bloom in springtime. Both Larner Seeds in Bolinas and the Wildflower Seed Company in St. Helena have great selections of seed mixes for Northern California. Clean up debris. To reduce the number of sites that harbor insects and diseases over winter, pull and discard weeds, spent annuals, and vegetables. Also clean up all fruit and fallen leaves. Compost only plant debris that’s free of disease, insect pests, and weeds. Rake out thatch buildup to improve water penetration and to eliminate insect habitat in your lawn. Feed fescue and other cool-season turf grasses with a complete lawn fertilizer. As summer flowers and vegetables give way to new plantings, add old, disease-free plants and debris to a compost pile or bin. Also mix in vegetable and fruit waste, coffee grounds, and grass clippings. Chop up large pieces so they break down faster. Keep the pile as moist as a wrung-out sponge. Depending on temperature, the size of the material in the pile, and the type of system, compost can take anywhere from six weeks to six months to mature (a barrel composter works faster than an open pile). If blooms on perennials such as asters, bellflowers, callas, daisies, daylilies, helianthus, heliopsis, rudbeckia, and yarrow were smaller than normal this year and plants are weak or crowded, it’s time to divide them: Dig out each clump so the rootball comes up intact. Gently shake off excess soil and divide with a sharp knife, pruning shears, or a shovel. Each division should have leaves and plenty of roots. Replant immediately.